I couldn’t resist recommending a recent Two Nerdy History Girls blog post on “pockets” because of the charming video of the song “Lucy Locket Lost Her Pocket” that is included, courtesy of Pauline Loven. For 18th century women, “pockets” were a separate part of their attire, not built into clothing as they are today. 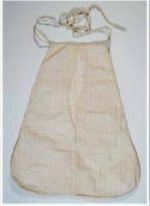 They were attached to a ribbon which was tied around the waist rather like an apron, usually worn under the skirt, and accessed through a slit. They could be capacious or small, plain or fancy, and hold a multitude of things. See my earlier post here. The dimity pocket pictured belonged to Abigail Adams. More information about it can be found here. For those inclined to make a pocket, follow the instructions issued by the Victoria and Albert Museum in London. After 1800, the type of pockets described were not suitable for the slimmer fashions, and women took to carrying reticules or purses.